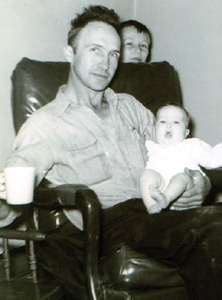 "Bobby," my Dad would often say very seriously, (he loved quoting poetry-- that's me behind the chair, sister Kathi in his arms) "Tomorrow is only a vision, yesterday is only a dream. Look well therefore to this day for it makes every tomorrow a vision of hope and every yesterday a dream of happiness." Those words burned into my mind and shaped my life. This was important information; he was my Dad. I paid attention. Then, like as not, he'd switch characters, give a big grin, belt out a loud, "Rowdy-dow!" pick up his Martin guitar and launch into playing the Strawberry Roan. And thus I was schooled in cognitive dissonance. A logger with an 8th grade education, he quoted both Omar Khayam and Robert Service with equal delight. In my early neural pathways Dangerous Dan McGrew and Sam McGee from Tennessee are celebrating in the frozen North with a flask of wine and a loaf of bread while the moving finger writes-- and it's Paradise enough. When I was nine he bought me a set of the Great Books and let me stay home from school if I read. Over the years I became an insatiable reader. Still am. It was not until my college years that music took root in my life the way reading did earlier. Do you know that people don't walk in a straight line? I didn't until one evening in Seattle, walking home from a girl friend's house. I happened to glance back at my footsteps coming up a sidewalk on Capital Hill, a slight dusting of snow on the ground. They meandered left, then right, weaving curves up the hill. We all leave footsteps, none in a straight line. These web pages are some of mine, my story, as I wove left and right through life with an attention to music. Over a lifetime of playing music I've been invited to the White House, broadcasted freedom folk music over the Iron Curtain, received a Grammy nomination, won a Tennessee dulcimer championship and was awarded an Einstein Certificate by the State of Washington. In retrospect those look like big footsteps. But to be fair --accurate rather-- I neither planned nor expected any of those things. They happened because I was pursuing my passion for the dulcimer. My goal was to learn about life. Music was the tool I discovered to help me do so. Music was also the translator of many other experiences for me. I vividly remember being a young folk singer standing for hours in the stairwell of the Museum of Modern Art in New York City transfixed by Rousseau's Sleeping Gypsy-- drinking it in, every hand-brushed detail. I was a country boy in the big city experiencing the transformative power of art for the first time. The serenity of that single image has been a talisman throughout my life both teaching and sustaining me as I reached out from Life's merry-go-round for the shiny brass rings. Equally sustaining have been the hundreds of people who have taught, counseled and sometimes cajoled me as I alternately be-bopped and blundered along this pathway. I learned, sometimes kicking and screaming, from mentors both in music and from other walks of life. They guided me as I put in the years of attention, study and practice it takes to get anything right. Along the way I made footsteps, traveled widely, wrote songs, recorded albums, authored books, earned degrees, made friends and managed to entertain myself and a few others. I eventually found out that songs from the heart with the simplest of rhymes, they have the power to reach through time. That was pretty big. I also found out that being happy ain't so bad and that it's OK to fall in love so long as you continue to do so every minute of every day.